Kirk Lundbeck is a 1976 graduate of Sycamore High School. He received his Bachelor of Music degree (B.M.) in 1981 with an emphasis on trombone performance and continued his studies in trombone and instrumental conducting through 1983. He has studied with some of the finest trombone instructors in the world, including Mr. James Mattern, Mr. Anthony Garcia, and Mr. Michael Mulcahy. He is currently studying with Mr. Jay Friedman, Principal Trombonist of the Chicago Symphony Orchestra. Mr. Lundbeck has performed with the Rockford Symphony Orchestra; the Illinois Symphony Orchestra; the Elgin Symphony Orchestra; the Kishwaukee Symphony Orchestra; the Symphony of Oak Park and River Forest, where he serves as co-principal trombonist; and has served as an extra with the Chicago Symphony Orchestra (CSO) since 2004. He has performed with the CSO at Ravinia and at Symphony Center and has been on tour with them to Florida. He has been a member of the DeKalb Municipal Band for the past 33 years and has served as Principal Trombone for the past 16 seasons. 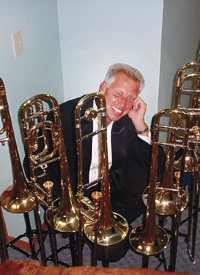 Often sought as a featured soloist and clinician, Lundbeck free-lances throughout the Midwest, is the former lead trombonist of the “Shananigans” Big Band and the “Class Act” Big Band, and is the leader of his own jazz trio, “The Black Tie Jazz Trio” which performs regularly throughout Northern Illinois. He currently also serves as the Minister of Music of St. John’s Lutheran Church in Sycamore, Illinois where he conducts two vocal ensembles. In January of 2006 an article featuring Lundbeck appeared in the International Trombone Association Journal.